This piece was originally posted on MLK Day 2016, here. It’s been lightly updated for 2018. It’s Martin Luther King Jr Day. A federal holiday, celebrated by all Americans, white and black, conservative and liberal, religious and secular, honoring the great civil rights leader. A day when we focus on the things he said and did. 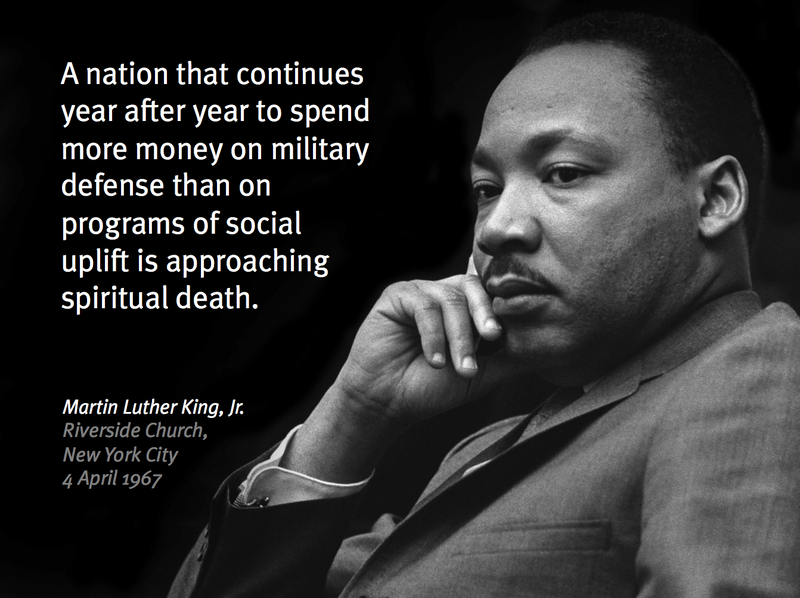 Except we have a rather narrow focus when we as a nation remember MLK. We focus on quotes like, “I have a dream that my four little children will one day live in a nation where they will not be judged by the color of their skin, but by the content of their character.” Because quotes like that one make MLK tame and safe and part of the establishment. It makes us think about racism as this thing that’s about overcoming a bad reaction to dark skin. It makes the civil rights movement an ascethic dispute that we won because no one hates black people for being black anymore, right? But here’s the thing: Martin Luther King Jr was not a cuddly teddy bear. MLK didn’t live to make white America feel better about itself by giving them a black person they could point to as that friend that makes them not-racist. MLK didn’t act in non-political, safe, widely-popular ways. He didn’t do and say things that the white, conservative-and-liberal, majority establishment embraced. He didn’t make us feel self-righteous and vindicated. MLK was a prophet in the truest sense, in that he came to challenge us and make us uncomfortable and show us our ever-present racist and bigoted ways. Most importantly, MLK didn’t come for white America. MLK came from and for black America, and our posthumous adoption of MLK as a balm to ease our own guilt and sin is a terrible (but perfectly representative) example of the white tendency to culturally appropriate the things we like about minority culture, while ignoring the deeper meanings and values. During his life, MLK fought for the equal rights of black America, not just in places like Birmingham and Selma and Memphis, but in Detroit and Washington DC and Chicago. All of white America was convicted, not just southern KKK members. And he didn’t challenge white supremacy by asking us to be nice. He challenged it by identifying and calling out the inherent, systemic racism present in our governing structures and civil society. He called out the white privilege of all people, that we walk around with everyday, in all that we do. He not only identified the structural racism, he worked to ease it’s effects by supporting anti-poverty measures and equality legislation like the Voting Rights Act. He was targeted not just by the KKK and other racists, but by the FBI and our very own political leaders. He understood that the liberation of his people was bound up with the liberation of all oppressed people, including poor working class whites and peasant villagers in Vietnam. That is why, during the last years of his life, he also spoke out strongly against the war in Vietnam and in support of anti-war efforts. It’s why his last work was the Poor People’s Campaign, an effort to raise living standards for all Americans by fighting for a higher minimum wage and the rights of workers to unionize and engage in collective bargaining. When MLK was shot and killed in Memphis, he was there to stand in solidarity with unionized sanitation workers who were on strike for higher wages and better benefits. Martin Luther King Jr worked for social justice and equality and the rights of all people to live and work and vote in a free society. And specifically, he worked to give black America the means to free itself from the shackles of white America. That fight is not over. If he were alive today, there is no doubt MLK would be in the streets of Ferguson and Baltimore and Oakland, standing in support of Black Lives Matter. There is no doubt he would be working against the continued austerity and attempts by elected officials to dismantle our safety net and measures he supported during his life like the Voting Rights Act and Medicaid. There is no doubt he would fight against income inequality and for universal health care. There is no doubt he would be marching against white supremacists in Charlottesville, and calling out the blatant racism and white nationalism being buoyed by our president. There is no doubt he would join the calls to remove the Confederate flag from government buildings, and for stricter gun control. There is no doubt he, too, would be kneeling for the national anthem, and supporting Colin Kaepernick. There is no doubt he would be standing against hate and bigotry towards our Muslim brothers and sisters, and the call for more war overseas. He would not, in short, be a middle class white totem of good feelings and confirmation of our biases. He would still be the object of scorn and hate he was for most of white America when he was alive. Today, let’s remember Martin Luther King Jr, but more importantly, lets feel convicted by his words and his actions, and know, his fight is on going and we, white America, we are part of what he was fighting against. That’s the first step to supporting his fight. MLK is not our security blanket, or the symbol of our progress. He was, and is, our accuser, and only be recognizing that, can we begin to move towards the America he envisioned.